Antique cotton fabric measuring 16.5 inches by 24 inches. Circa 1820 based on the print and dyes. 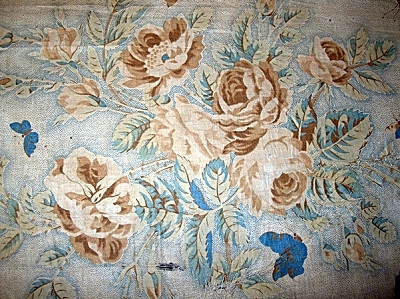 Large scale flowers, roses, and leaves, with butterflies, in browns and blues, and a brown picotage ground on off white. In fair condition. There are spots, and holes and conservation efforts made with patches and stabilization. This was previously part of a museum collection, so there is also a catalog tag sewn on the back.